The foreigners arrived from Qatar and walked for a flight to Vienna. However, due to the vigilance of the border guards they failed to get to Austria. Three citizens of Malaysia attempted to get to Austria by someone’s documents. 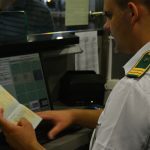 However, during the selective control of transit passengers from the countries at risk in the airport “Boryspol” the border guards of the Separate checkpoint found that three people have the passports belonging to other persons. Currently, the violators are sent a by a back flight to Qatar. This entry was posted in Translated Media-News from Ukraine on May 24, 2018 by oksana.